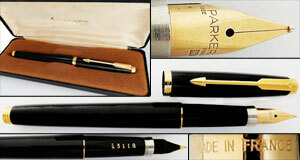 Parker 75 y 45 were the two first Parker models with user-interchangeable nib assemblies. By 1960, in competence with ball pens, traditional fountain pens were seriously in decline and all pen makers in difficult troubles. Parker was still selling the “51”, but the capillary-filling 61 required more expertise than most people may have and for that reason was unpopular. In 1960 Parker introduced the 45, named for the famed Colt Peacemaker revolver of the Old West. 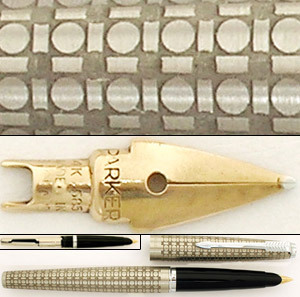 This model was the first Parker cartridge filler model, which Waterman has already adopted in the CF model. But the 45 has an additional attractive feature: a user-interchangeable nib assembly. 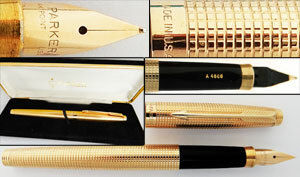 The 45 flourished and have been produced in more finishes than any other of the company’s pens. During 1968 Parker Argentina adopted the 61-line clip also for the 45. So the Argentinean 45 pen sets for this period (1968 until mid 70’s) bear a much detailed arrow clip unique among the standard production from all the other sites. In particular ball pens and pencils of 45 and 61 are closely alike. They can be distinguished because the 61s have engraved the number model and plastic tassies, while the 45s have metallic tassies and no number model engraved.